I think it's a brilliant way to exchange goods and services and it truly is the wave of the future. I think it gives people the opportunity to develop and hone skills they may not have otherwise realized were valuable. I am a married mother of 3. I work from home with KEEP Collective and Perfectly Posh, am a blogger and am hoping eventually to be able to work as a freelance genealogist. 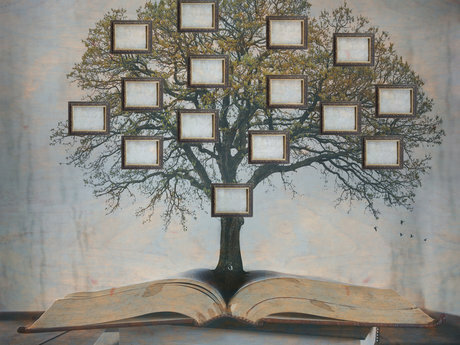 Right now, genealogy is a hobby and passion of mine. I've been tracing my own family tree and helping others for over 10 years. I'm a member of the Ohio Genealogical Society as well as several local historical societies. I am meticulous in my research and love nothing better than getting good results, either for myself or for a client. My other hobbies include travel (so far I've been to Canada, Quebec, Mexico, The Bahamas, Grand Cayman, and France and all over the eastern and southern United States), writing, reading, going to concerts, comedy, and snail mail swaps. Favorite TV shows: The Walking Dead, It's Always Sunny in Philadelphia, Penny Dreadful, The Exorcist, Seinfeld, United States of Tara, Weeds, The Tudors, Downton Abbey, American Horror Story, First 48, Intervention, The Strain, Orange is the New Black. Favorite Movies: Gone With the Wind, Bram Stoker's Dracula, Purple Rain, Braveheart, Fight Club, The Big Lebowski, Chocolat, Anchorman, Eternal Sunshine of the Spotless Mind, Amelie, Young Frankenstein, Shaun of the Dead. Other favorites: Sushi, French cuisine, photography, Paris, horror movies, Halloween, pink, history, true crime, documentaries, the beach, yoga, mythology, Buddhist and Hindu studies. Michelle was awesome throughout the entire process and I'm very happy with the result. I would definitely recommend her services. Thank you! What a pleasure it was working with you. I am so happy to find out this new information. And was very pleased.